Invest in a new fence this spring! There are many reasons homeowners decide to install new fences for their yards. They usually center on one of the following factors: security, privacy, safety, or curb appeal. Whatever the reason that has brought you to this decision, it’s important that you use your resources and investments wisely, by choosing the right fence for your yard. Let’s go over some of the factors that will ensure that your fence choice is the right choice. 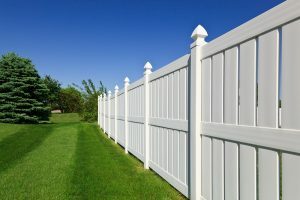 The first way to ensure that you’re going to purchase and install the right fence for your yard is to ensure that you’re working with professionals who have the expertise and reputation to get the job done right. Ask your neighbors and family members for recommendations of contractors that they’ve worked with in the past and whose service and reliability they came to depend on. A professional contractor will secure all the appropriate building permits for your property and work with quality tools and materials to ensure that your fence will do its job for many years to come. Ensure that they are licensed and that all forms of communication will remain free and open throughout the process. Once the fence has been installed, the rest of left up to you. Therefore, when choosing what style of fence would be right for your yard, also consider that that type of fence will also be the right choice for your lifestyle. If you’d prefer a fence that won’t require much maintenance, consider vinyl or aluminum options. These materials won’t require much upkeep, outside of general cleaning, to maintain their appearance. Wood requires the most maintenance but also offers the timeless look and versatility that many homeowners enjoy. It can be painted or stained any color to tone to complement your home or landscape design. In many neighborhoods, the Homeowners Association is in place to help ensure that the neighborhood will remain a well-maintained place, in many cases, to help protect property values and the overall appeal and consistency of the area. With that said, your HOA may have rules pertaining to fence installation, including height and color options. Likewise, even without an HOA, your municipality may have rules about fence installations. Check with these entities before starting any work, to ensure that you won’t incur any additional fees for your fence. This entry was posted on Friday, March 30th, 2018 at 4:12 pm. Both comments and pings are currently closed.